Mixed reviews for Mother at Cannes Film Festival · K-POPPED! 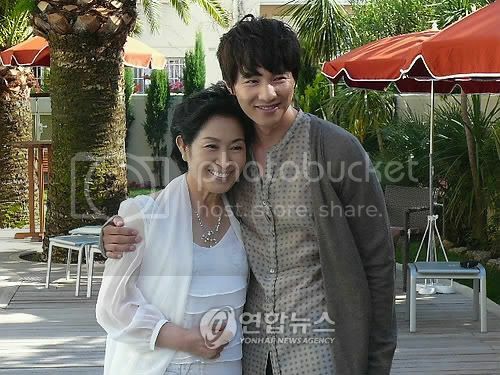 The screening of Korean movie Mother at the 62 Cannes Film Festival was on May 16 at 2pm. The press and general public attended the first screening in sunny and breezy Cannes. Bong Joon-ho channels Pedro Almodovar in his fourth feature, an operatic melodrama revolving around a knockout central performance from TV star Kim Hye-ja. Filled with the elegant compositions and mood-drenched cinematography which are becoming Bong’s specialty, Mother is a largely satisfying film which marks the director out as South Korea’s most versatile young auteur. Alex Billing (USA) said that Mother is an interesting piece but it feels like Park Chan Wook and Bong Jun-ho has traded positions. “Mother really has a Park Chan-wook film feel”, says Billing. The movie will be released in Korea on May 28th. More pics of Kim Hye-ja, Won Bin, Jin Gu and director Bong Jun-ho in Cannes after the jump.